Call it political naivete. But Indian non-governmental organisations ( ngo s) and business organisations have hosted a series of meetings over the last year in metros across the country, where claims have been made that the Clean Development Mechanism ( cdm ) proposed by the Kyoto Protocol under the un Convention on Climate Change ( unfccc ), is good for the country. This is despite a strong and considered position held by the Indian government in the international forum that cdm is unacceptable to the country in its current form, without per capita entitlements. cdm , a mechanism for trading emission credits between industrialised and developing countries, is emerging in the climate negotiations as a patently unfair way of helping industrialised countries like the us spend as little as possible in meeting their commitments to reduce greenhouse gas ( ghg ) emissions. Through the cdm , countries like India will compete with each other to provide industrialised countries with the cheapest option to make reductions, leaving no least-cost options for themselves when it is their turn to take on emissions reduction targets in the future. Moreover, what they will be trading away under cdm is the right of the present and future generations to the atmosphere (see Down To Earth , Vol 8, No 21, and Green Politics: Global Environmental Negotiations 1, published by the Centre for Science and Environment ( cse ), October 1999). Along with China, India has led the demand for social justice and equity in the international climate negotiations. In this, the government deserves the support and active encouragement of Indian civil society, particularly since their stand has come under strong opposition from the us , which has refused to ratify the protocol unless countries like India and China agree to cdm . After the us Senate had passed a resolution demanding 'meaningful participation from key developing countries' as an absolute prerequisite to signing the protocol, the us government has employed considerable ingenuity in bringing on international pressure onto developing countries to agree to trading. But, instead, the meetings hosted by some Indian business organisations and ngo s last year seem to indicate that these representatives of Indian civil society have chosen to support the us in eroding India's international position. Not surprisingly, all these meetings have been funded by usaid , and most of them have been attended by Kathleen McGinty, Al Gore's and, subsequently, Bill Clinton's principal environmental policy adviser for ten years, and chairperson of the White House council for environmental quality. In fact, the first indication of the lengths the us was willing to go to win over Indian opposition to the cdm came when Kathy McGinty stationed herself as a research fellow at the Tata Energy Research Institute ( teri ) in New Delhi for a year. She came with her husband, Karl Hausker, also a former senior official in the us Senate and the us Environmental Protection Agency ( epa ). At the Kyoto conference in 1997 and then at the fourth conference of parties in Buenos Aires in November 1998, it became amply clear that the two main opponents to the us demand for emissions trading would be India and China. What were two senior members of the Clinton administration doing as research fellows in an institute in Delhi for a year? The reason was soon apparent, at a series of public speeches by McGinty in Delhi, and, subsequently, in Bangalore and Calcutta, where she focused on persuading audiences that cdm is the best thing for India. In her speeches, McGinty made no effort to offer a constructive response to the criticism of cdm by the Indian government and cse , or even mention that the Indian government was opposed to cdm . It was as if the official Indian position did not exist. At some of these meetings, representatives from usaid accompanied McGinty, and made promises of money for climate change abatement in India. And all over the country, ngo s, research institutes and business representatives fell for the obvious, time-tested trick industrialised countries resort to as a means of countering honest, ethical, scientific or even socio-economic objections raised by developing countries. Promise short-term financial gains, and watch the objections, however genuine and serious, melt away. Perhaps the biggest casualty of the McGinty circus was the Confederation of Indian Industries ( cii ). With funds from usaid and overall direction from Hagler Bailly, a "international consulting agency", cii produced a paper, Investment Potential for the Clean Development Mechanism in India , claiming that Indian business stood to gain at least us $1 billion a year from cdm . What this obviously us -centric study did not look at was how much more India would stand to benefit if their demand for equal per capita rights to the atmosphere was accepted at the climate negotiations. The Indian industry, taken in with this promise of short-term benefits, has started to work against the government position which argues for the country's right to development and, therefore, takes into account their long-term interests, and instead joined hands with usaid in pushing for cdm . They currently look all set to shoot themselves in the foot by accepting a framework for the climate convention that will, very soon, demand that they take on carbon reductions. In April 1999, usaid , along with six other Indian ngo s and institutions (including teri, Indian Institute of Management Ahmedabad, cii and Development Alternatives) launched a "Climate Change Outreach and Awareness Programme". 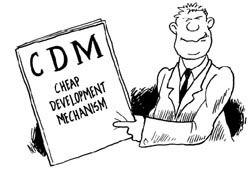 At a meeting of this group in New Delhi in August organised by Development Alternatives ( da ), Ashok Khosla, its president, spoke of the "wonderful concept" of cdm that had been "carefully negotiated". Perhaps more honestly than he meant to, he described the awareness group as a "kind of mafia to influence the negotiations". It was clear at this meeting that usaid was putting a lot on money into disseminating the one billion study. Both cii and the Federation of Indian Chambers of Commerce and Industry ( ficci ) had received funds to set up websites and for "awareness creation". McGinty's mission culminated with us secretary for energy Bill Richardson's visit to India in October 1999. Richardson and minister for external affairs Jaswant Singh signed a joint statement on 'cooperation in energy and related environmental aspects'. Richardson pointedly referred to the role played by McGinty and the cii in bringing about the statement. " cii and Katie McGinty are really to be congratulated," he said. "Recognising the dangers of climate change they also saw the tremendous opportunity for India presented by the cdm ." Earlier, in May 1999, at a meeting of Indian business persons specially invited to Washington dc by the us government to participate on a dialogue on cdm , Richardson had warned that without India there would be no ratification of the Kyoto Protocol. "While politicians and diplomats are standing still in policy, I think it is important what you are doing, moving ahead," he told the industrialists. The statement signed by Singh and Richardson promised all sorts of cooperation from India in sorting out the Kyoto mechanisms, of which cdm is one (see box: Worded in diplomacy ). But the Indian government seemed to have given some thought to the wording, and stuck to generalities. No definite promises have been made to agree to the cdm . How much the statement will harm the Indian position in future remains to be seen. Indian negotiator Vijai Sharma from the ministry of environment and forests, while unwilling to make a direct statement, dismissed it as a "bilateral agreement", saying the unfccc negotiations were "multilateral". In the us , however, Al Gore hailed the statement as a 'breakthrough', giving it far more importance than the Indian government. "This is a breakthrough because India is one of the two most important and largest developing nations and they've now changed their posture," Al Gore said on an abc news programme in November 1999. He was also referring to a similar agreement signed with China, the other country demanding equal rights to the atmosphere, during Chinese premier Zhu Rongji's visit to the us in April 1999. Rongji and Gore signed a statement of intent on the development of a sulphur dioxide emissions trading feasibility study, pushed for by the us in the hope that it would move China closer to the concept of emissions trading. During his visit, Richardson went a step further and called for commitments from India to reduce ghg emissions, in order to be able to make use of the other Kyoto mechanisms. "India will benefit financially from assuming a target under the Kyoto Protocol because only parties with emissions target can take advantage of all the benefits particularly international emissions trading under protocol flexibility mechanisms," he said, addressing a meeting organised by the cii . Once again, Richardson spoke half-truths in his desperation to get commitments from India. Argentina, the developing country that has taken on a voluntary commitment under the fccc with the intention of making fast money through the other Kyoto mechanisms, has, for example, become the focus of frenzied debate between Northern ngo groups. In email exchange between members of the North-dominated Climate Action Network ( can ), some experts argued that allowing Argentina to use mechanisms available to countries that have signed the protocol will dilute individual country targets, because the number of countries that have to meet the 5.2 per cent collective reduction target will increase. Others found it unacceptable for developing countries to adopt a target below the business as usual ( bau ) level, saying the bau is difficult to predict, and such an arrangement would generate tropical air -- unused emissions for developing countries to sell. The ease with which even senior and respected academicians in India adopted the us line raises some serious questions. How long will promises of money and technology transfer be the deciding factor for our position in international negotiations? What is the role of civil society in this country? One thing is certain -- the us government will stop at nothing to get cdm through, and India is likely to come under considerable political pressure this year to accept the cdm as it is, giving up talk of equity. The Indian government will need all the support and pushing it can get to stick to its guns and refuse to compromise.